Regular readers of the Pastel Journal may have noticed the last page of the October 2014 issue featured Woman with a Medallion by Lucien Lévy-Dhurmer in the Great Pastels series. This piece was a considerably abbreviated version of the original article I wrote for the Journal. Here is the complete article. 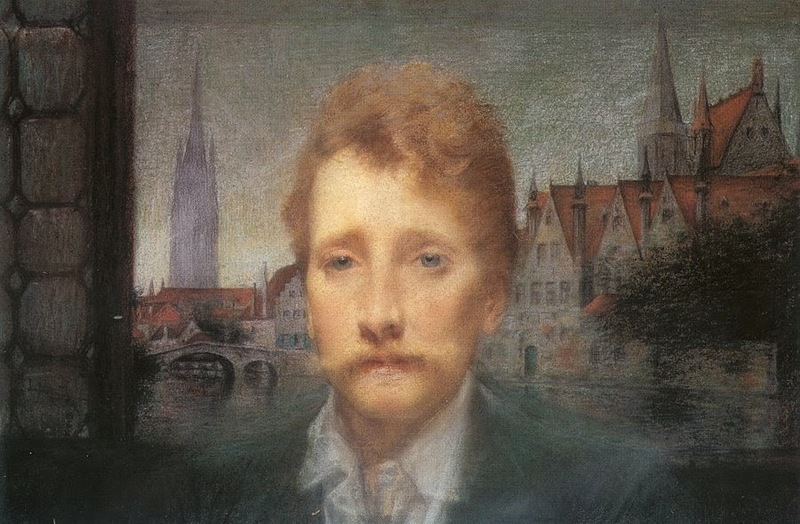 Lucien Lévy-Dhurmer was born Lucien Lévy in Algiers in 1865, to Solomon Levy and Pauline Amelia Goldhurmer. He returned as a boy with his family to France and in October 1879, at the age of 14, he began studying at the École communale supérieure de Dessin et Sculpture, and was accepted at the Paris Salon of 1882, well before he had finished schooling, showing a small ceramic plaque featuring the Birth of Venus in the style of Alexandre Cabanel. From 1886 to 1895, in need of money, he began as a ceramic decorator and climbed to artistic director of the studio of Clément Massier at Golfe Juan, near Cannes on the Côte d’Azur. He became known for his experimentations with metallic luster glazes based on Middle Eastern and Hispano-Moresque pottery, and around 1892 on becoming director he co-signed his first pieces of ceramics together with Clément Massier. Meantime he continued to paint in oil and pastel, exhibiting in Paris with the Peintres de l'âme in 1894 in a show organized by the journal L'Art et la Vie. In 1895, nearing his thirtieth birthday, Lévy travelled to Venice and Florence, where the work of da Vinci and the Renaissance Masters had a profound influence on him. The trip markedly re-focused him on his earlier artistic ambitions. He returned to Paris and his art. In Paris he settled in a studio down the road from Gustave Moreau’s in the ninth arrondissement. The Belgian poet Georges Rodenbach, through a mutual friend, soon invited the young artist to lunch; he wanted Lévy-Dhurmer to draw his portrait. The portrait, now in the Musee d'Orsay, is a testimony to the rapid friendship coloured with mutual respect which grew up between the two men. In it the poet is shown full face against a background suggestive of the town of Bruges in reference to the book which made Georges Rodenbach famous: Bruges-La-Morte. After 1901 Lévy-Dhurmer moved away from expressly Symbolist content, except in some representations of women illustrating the music of Ludwig van Beethoven, Gabriel Fauré and Claude Debussy, and in some landscapes, although he was already incorporating more landscapes into his work because of his travels in Europe and North Africa. Travelling in North Africa and then Turkey he made greater use of pastels, easier to carry and use when traveling, and they remained a favored medium throughout his subsequent career. He participated in some group exhibitions, was a regular at the Salon d'Automne, and had 8 further solo shows. After 1900 he experimented with a technique of using diffuse restricted colours, often with a bluish tint, which he continued with up to his death, long after Symbolism had been forgotten. Around 1910, he began to explore the process of interior decorating, leading to a commission from Auguste Rateau (1863–1930), for his apartment at 10 bis Avenue Élysée-Reclus, near the Eiffel Tower. Rateau was an engineer who manufactured internal combustion engines and a member of the Académie des Sciences as well as an art connoisseur with a particular interest in the Art Nouveau movement. Lévy-Dhurmer, like many of his contemporaries (such as Josef Hoffmann in Austria, Charles Rennie Mackintosh in Scotland, and Frank Lloyd Wright in America,) worked as an ensemblier, conceiving interiors as "total works of art" by designing not only the architectural setting but also everything that went into them. 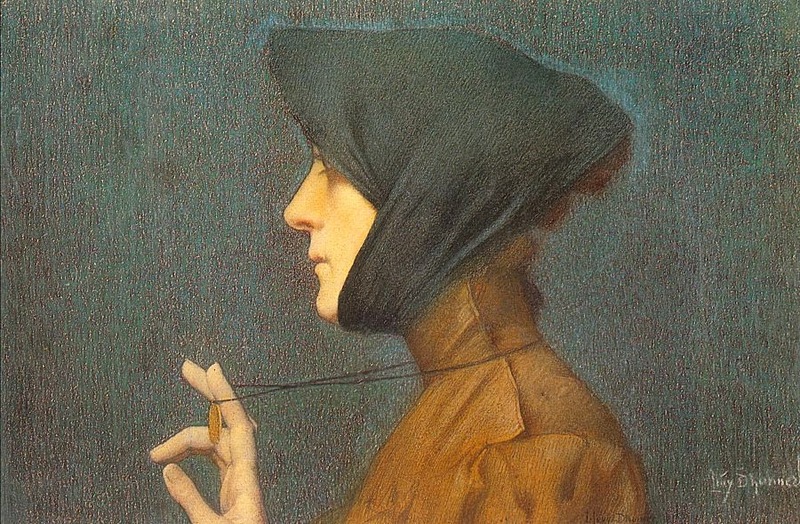 Lévy-Dhurmer used pastels a great deal, the medium readily lending itself to the magic of symbolism; several of his contemporaries, particularly Fantin-Latour and Fernand Khnopff, were equally attracted by his pastel technique. He was influenced by the ideas both of Khnopff and the Pre-Raphaelites, by Puvis de Chavannes and by Florentine and German painters of the XV-XVI century. This is particularly evident in the Femme à la médaille, 1896, Paris, Musée d'Orsay ; and in l'Automne, 1898, Saint-Étienne). A great traveller, to Italy, Spain, Turkey, Morocco, and Brittany, Lévy-Dhurmer's went through a realistic period where his works expressed simply the warm colours of nature or the curious personality of his models. This, in the first decade of the century, was when he produced much of his best work, notably Les Aveugles de Tanger, 1901 (Paris, Musée National d'Art Moderne), and the Mère Bretonne (Musée de Brest). 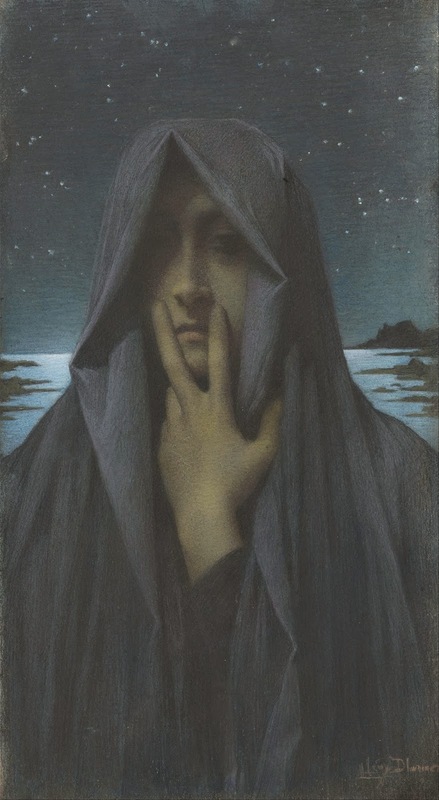 He then tried to fashion a synthesis between reality and his artistic intuition, but he remained above all a master of esoteric Symbolism: he preferred to evoke mysterious appearances, distant faces with a mysterious pallor, such as Le Silence, 1895, a picture that Levy-Dhurmer kept throughout his life, and one of his most fascinating works. There is no clue to identity, or location; it is timeless, devoid of context, making it thereby both symbolic and universal. It owes something of its intensity to the use of pastel , the hatching strokes makes the whole image shimmer. In 1899 the critic Achille Ségard likened the face to "that of a statue". He was perceptive. For although Lévy-Dhurmer was influenced by the historical iconography of silence, as expressed in the depiction of Horus, the Egyptian deity, he took his inspiration more directly from the medal sculpted by Auguste Préault for Jacob Robles' tomb in the Père-Lachaise cemetery. 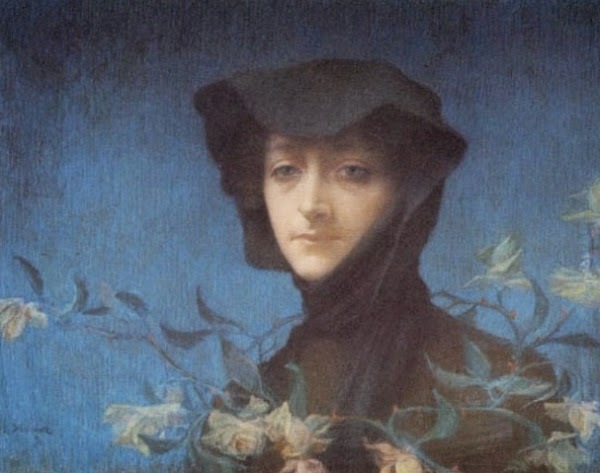 Exhibited in Paris in 1896, and again at the end of 1899 and the beginning of 1900, Le Silence fascinated his contemporaries, and had a major impact on the Symbolist generation from Fernand Khnopff to Odilon Redon. It was acquired by the collector Zagorowsky in 1953, just before the artist’s death, and passed to the Bobritschew collection in 1976; the French state acquired in it lieu of death duties in 2006, and it now resides in the Musée d’Orsay. His exquisite portraits include those of Rodenbach (1896), Pierre Loti (1896), and Natalie Clifford Barney, (1906)notorious salon hostess and daughter of American painter Alice Pike Barney. (In 1882 Barney and her family spent the summer at New York's Long Beach Hotel, where Oscar Wilde happened to be speaking on his American lecture tour. Wilde spent the day with Alice and her daughter Natalie on the beach; their conversation changed the course of Alice's life, inspiring her to pursue art seriously despite her husband's disapproval). In 1914, when he was forty-nine, Lévy-Dhurmer married Emmy Fournier, nine years his senior, who had been an editor of the early feminist newspaper La Fronde until it ceased publication in 1905. By this time he was working primarily on landscapes, both oil and pastel, in a style similar to Whistler and Monet. He died in Le Vésinet, Yvelines, in 1953. This painting is well named Mystère. It is done in pastel and gold leaf on paper mounted on card, 35 x 54 cm, painted in 1896 – who is the subject? What is the medal? To whom is she showing it – to a lover, a husband – a mirror? The woman is tightly dressed, almost concealed in a coat with a high collar and a scarf wrapped round her hair and lower jaw, with just her face exposed. The colours are muted - it has the simplicity of a Whistler, but we remain forever intrigued.